While Canada has a national tree, horse, and animal, it doesn’t have a national bird. The Royal Canadian Geographical Society, and its magazine Canadian Geographic, believe that it’s time to remedy this oversight and so have started a national campaign to establish Canada’s national bird, The National Bird Project, by asking Canadians to vote for their favourite species. There are 40 bird species that you can choose to vote for, from the Harris’s Sparrow to the Northern Goshawk. So far, the Common Loon is in the lead with the most number of votes, with the Snowy Owl not far behind it. The winning species will be announced in Canadian Geographic’s next annual wildlife issue, and the RCGS and magazine will then promote it in the hopes that it will be named the official bird of Canada in time for the country’s 150th birthday on July 1, 2017. If you’re having a hard time choosing a bird to vote, then read this excellent article about “A Case for the ‘Underbird”, by my friend Jody Allair, a biologist and science educator at Bird Studies Canada. “This Hour Has 22 Minutes” recently featured a segment on the campaign, which you can see here. 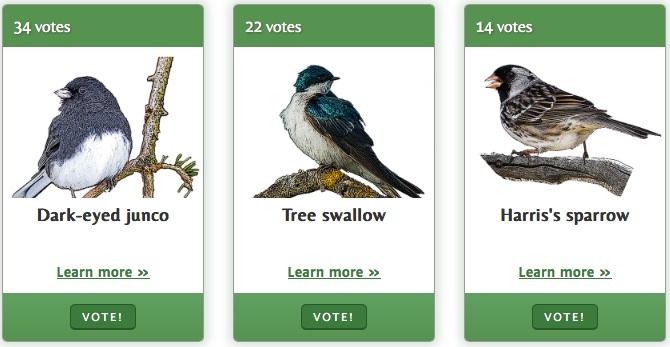 Vote for your favourite bird here and maybe it will become Canada’s national species! 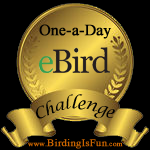 This entry was posted in Articles, Bird Conservation, Canada Birds, General Birding, Nature and tagged Bird Studies Canada, Canada's National Bird, Canadian Geographic, The National Bird Project. Bookmark the permalink. I can’t see any other bird but the loon taking the cake and becoming the national bird of Canada. “Canada” is (almost) a synonym of boreal forests dotted with lakes, and “boreal forests dotted with lakes” is (almost) a synonym of the call of loons. I like them all; which one most represents Canada?